The Exclusive Option Leather Stitched Rear Seat Luggage Stop Trim features contrasting stitching sewn across the width of the part, complementing the rich leather surface. 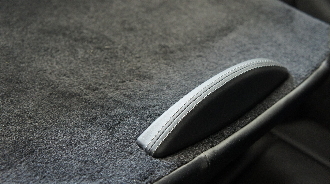 These Leather Luggage Stops are a very rare option that was made available by Porsche in late 2010, and is standard on the limited, European-only 911 Sport Classic. These rear seat trim parts are an easy DIY installation that instantly adds a distinctive look to rear of your 911, especially with the rear seats folded down. Replacing the textured plastic with leather gives your Porsche a distinctive finished look that matches the front of the cabin.